We have a rebuilt Accufast KT tabber available. It is in very good condition having been recently refurbished. It comes with a 90 day parts and labor warranty along with all accessories. It will handle KT clear, white, translucent – translucent and colored tabs at speeds of 8-10,000 per hour ( realistic ). The KT is a proven workhorse that can handle millions of pieces while requiring a minimum of service. 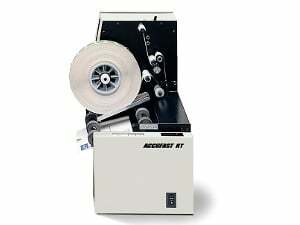 If you need to add a feeder we have a new Accufast UY feeder available for $850.00. If you have any questions or need additional information don’t hesitate to contact us at 866 430 2874.